A juvenile red-tailed hawk was brought to the Wildlife Clinic from Malden by the Environmental Police on October 22, 2017. It was found down on the ground, very lethargic and unable to fly. Upon initial exam, the hawk became progressively dull and it was noted that the lining of its mouth was extremely pale. Bleeding was seen on its foot, but no fractures were evident on radiographs. Bloodwork showing that the hawk was severely anemic (decreased red blood cells) and that the hawk’s blood did not clot normally supported a diagnosis of anticoagulant rodenticide toxicosis. Anticoagulant rodenticides, or rodent poisons, interfere with blood clotting and can cause excessive bleeding, as from the minor laceration on this hawk’s foot. Death can potentially occur due to hemorrhage if the animal is not found and treated in time. Fortunately, for this hawk, it was caught in time. After 4 weeks of treatment with an antidote to the poison, this hawk recovered fully, and was successfully released on November 29, 2017. Anticoagulant rodenticides are used widely in the United States to control and kill rats and other rodent populations in various settings, including urban, suburban and agricultural areas. Unfortunately, they can also kill raptors, which are exposed by consuming contaminated prey. 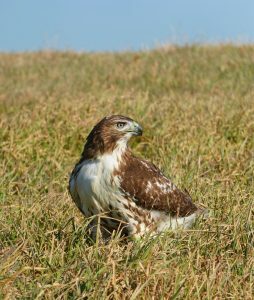 Maureen Murray, DVM, DABVP, Clinical Associate Professor, and Assistant Director of the Tufts Wildlife Clinic is studying the effects of anticoagulant rodenticides in raptors. To read more about her research, go to https://vet.tufts.edu/wildlife-medicine-program/research-2/anticoagulant-rodenticides/. If you are interested in donating to her research, the Ruby Memorial Research Fund has been created to fund the study.